Scrambling can be enjoyed by anyone who likes an exciting challenge. We offer scrambling courses in North Wales for all levels of ability. The Snowdon area offers some of the greatest and longest scrambles in the UK. Here we have the opportunity to climb mountain buttresses and exposed ridges to the tops of some of the most famous UK summits. Whether it's your first grade 1 scramble or you wish to gain the skills and confidence to tackle your own grade 3, we'll teach and guide you on that classic mountain scramble..Crib Goch, Bristley Ridge, Dolmen Ridge, Sub Cneifion Arete to name a few. 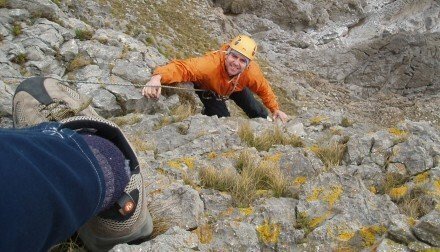 With a qualified Mountaineering Instructor you learn to gauge the difficulty of a route, each you how to protect both yourself and your partner. You' ll also learn aspects of rope work used on scrambles; placing rock protection, belays, running belays, moving together, short roping and retreating / abseiling. All our courses are tailored to your requirement. We work with minimum group size of 2 and maximum of 3. We provide all equipment required.